What Is Deionized Water and Which Piping Materials Convey It Effectively? Demineralized or deionized water is used for many lab reactions, laboratory equipment washing, industrial processing applications and more. This water has been purified of ions, minerals, bacteria and other organics that may have been present. Any of those contaminates can alter chemical reactions, cause scaling and corrosion for piping systems, and create a number of unique problems for specific applications. Once demineralized and deionized, water can still harm piping systems if the wrong material is specified because pure water becomes more reactive. Learn about the use cases, qualities and preferred piping systems of purified water to keep your flow free of contaminates and your piping system running longer. Manufacturer cleanrooms keep small particles from adversely affecting production quality. Semiconductor plants, for example, often use cleanrooms when layering and etching silicone wafers for computer chips. Because many hazardous, highly reactive gases and liquids are used to keep semiconductor processes clean, accidental fires can occur. Even the smallest fire and subsequent smoke can: Contaminate a cleanroom, putting a semiconductor plant out of operation for extended periods of time. Create a fire hazard and require immediate evacuation. A proactive solution—typically required for cleanrooms—is to use fire retardant materials across the cleanroom that are both difficult to ignite and give off little to no smoke. When specifying cleanroom piping, ducting, flooring and more, semiconductor manufacturers should look for materials tested in accordance with FM 4910 standards. 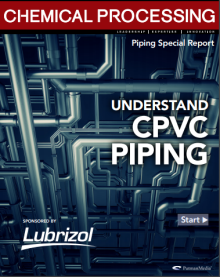 Which Piping Materials Maintain Water Purity Standards? When the purity of water and other solutions is critical, each component that comes into contact with the fluid—such as the piping material—must maintain high-purity standards throughout its life. The smallest system impurities can: Inhibit the effectiveness of the system Reduce the life of expensive systems Increase processing downtime Cause health issues for the end product Impurities in a solution are a result of leaching, or the dissolution of metals, solids and chemicals into a fluid. Consider lead piping, for example. Before the Environmental Protection Agency (EPA) implemented the Lead and Copper Rule (LCR) in 1991, lead piping was used for plumbing. After the lead pipe began to corrode—whether from water temperature, acidity or a lifetime of wear—the lead would leach harmful contaminants into the water supply. Read on to see why industries should care about leaching and the materials that maintain water purity.